"Jurassic Park" came out in theaters on June 11th, 1993. I saw it June 12th. 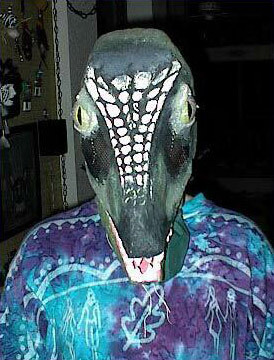 Along with dragons and various furry critters, I've had a love of dinosaurs all my life. When I left the theater, I was... inspired, to say the least. (Okay, okay, I walked crouched down like a raptor and hissed at people for the next week.) 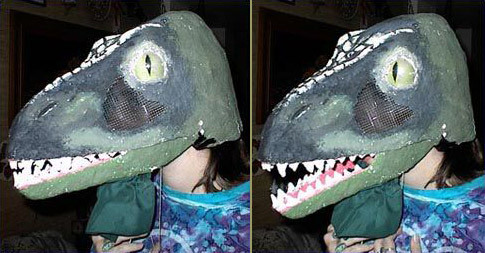 I saw and liked the commercial masks (velociraptor and dilophosaur), but I thought I could do one better — why not build a mask with a moving jaw? It seemed so natural; the motion — my own jaw — was already right there. So I set to work. Three tries later, I finally got it. I made the eyes out of those little plastic domes that the prizes in those 25 cent machines come in. The inner part of the eye is made of half of one of those domes. The outer part was smaller (the eyes actually can move, via strings that I have to pull on... not technical at all, but pretty clever for when I made it! ), and clear except for the pupil. Both parts were painted with acrylic paint on the inside, so they'd still be shiny. Note that I haven't really mentioned the body on this costume. That's because almost no effort went into it. It consisted of a leotard and tights, dyed to roughly the same color as the mask. The hands and feet were green cloth, very roughly sewn together (I didn't know how to sew at the time, either). The claws were... I don't know if you've ever seen them, but some craft stores sell black plastic eagle and bear claws. I used the eagle claws on this costume. 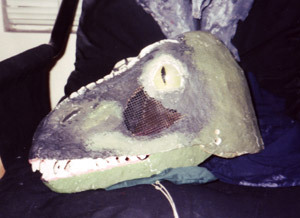 The big raptor claws on the feet were cardboard, covered in papier mache and painted black. The tail was a cone of green fabric that, if I tied it fairly tightly around my waist, would stick straight out behind me if I crouched like a raptor. That looked okay, but again, it wasn't really worthy of a picture. Even if it wasn't that great, I love this costume for a lot of reasons. It got me started on costuming, which has been a great hobby and a big part of my life ever since. Also, it brings back a lot of good memories. Namely, it was the last time I got to go trick-or-treating. (If you look, I even made a little pouch under the mask so people could put candy in my mouth and I could catch it there!) I miss trick-or-treating a lot, but I'll never forget that last year... got a lot of ooh's and aah's, scared a few people, got into a roaring contest with Freddy Kruger... those were the days!